One of your Carvey’s most important assemblies is the Smart Clamp which allows the machine to automatically locate a zero point for the Z axis no matter the material or bit used. There is a button located on top of the Smart Clamp that registers a press from the milling tool when you begin a carving job. Over time, the cavity between the metal button and the actual switch can become clogged with debris which may lead to failed carves. 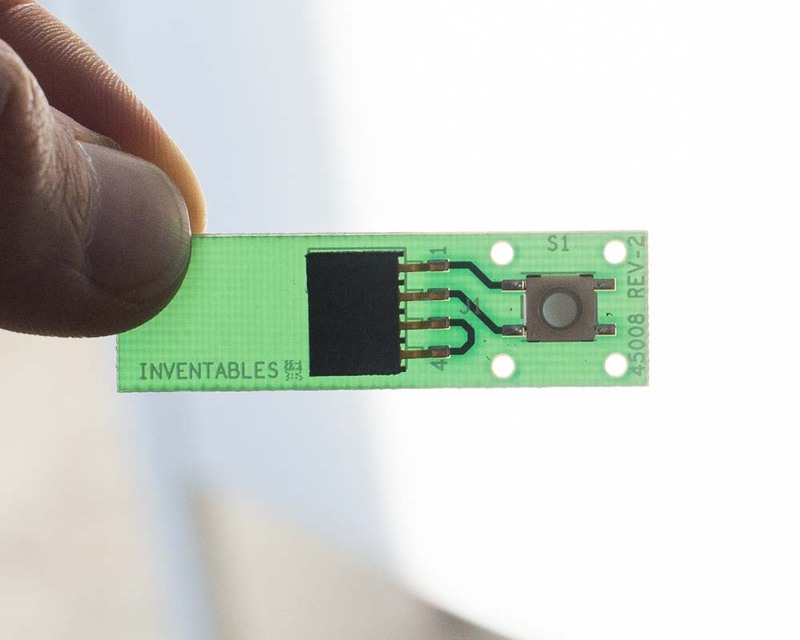 If you need replacement parts for your Smart Clamp, please contact our support team at help@inventables.com. Exit Easel if you have it open and disconnect your machine from your computer. Turn your Carvey off and unplug it from the wall. Make sure you have enough space at your workstation to work comfortably. Have a small bowl or magnet handy to place small screws in. 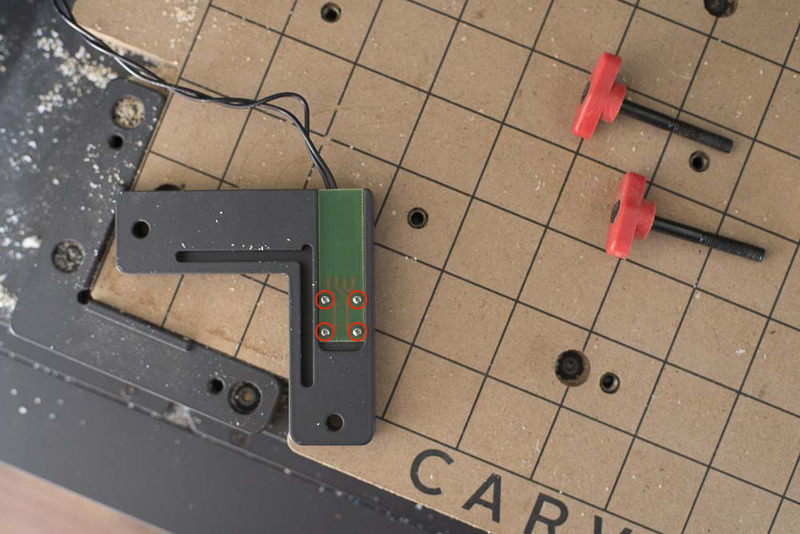 Unscrew the two clamping bolts from your Carvey’s Smart Clamp and set them aside. Remove the Smart Clamp from the board and turn it upside down, exposing the switch PCB. Locate the four screws located on the Smart Clamp’s switch PCB. Use a #00 phillips head screwdriver to loosen and remove each of these small machine screws. Take great care to ensure that the small screws don’t slip between the slots in the floor of the carving area. This is less than fun. Should you make this mistake, refer to the section on cleaning for instructions on how to remove the floor of the carving area to retrieve the screw(s). 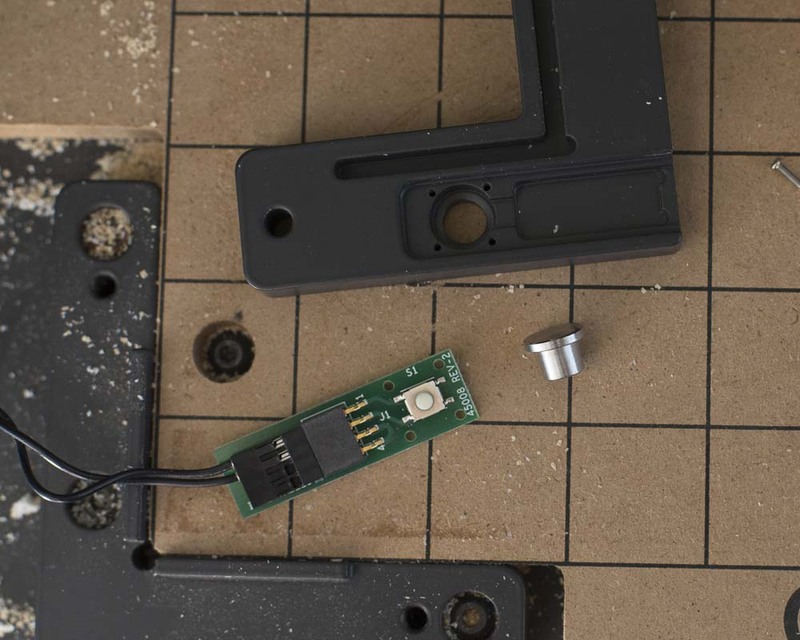 Once the PCB is off, you can remove the metal button that pokes through the top of the Clamp. 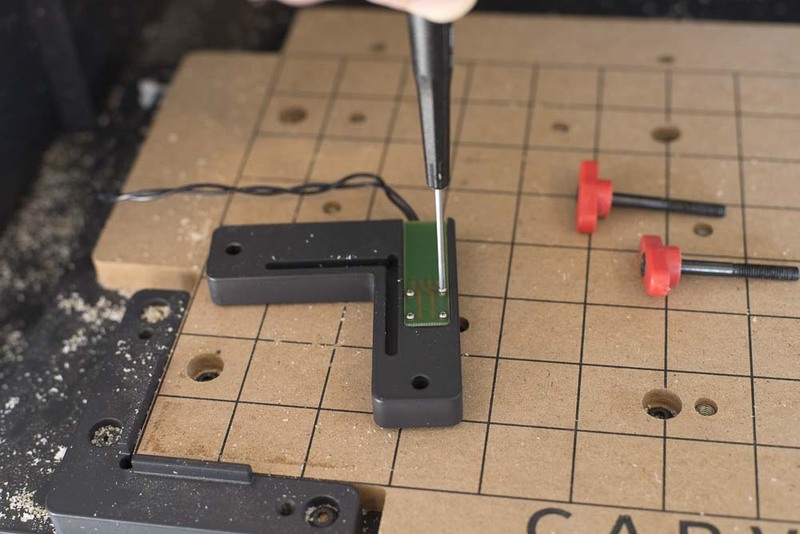 You can also disconnect the Smart Clamp PCB from its wire by removing the header pins. Note that the switch is connected to a four pin header, though only pins 1 and 2 are connected to the switch itself. It is imperative that you reconnect the header in the right configuration or your machine will malfunction. You can see the traces leading to the switch on the PCB if you hold it up to a light source. Use a brush and/or cloth to clean both the metal button and the switch PCB as well as their mounting cavity on the clamp itself. Do not use solvents or other liquid cleaners on these parts as it may cause damage to the clamp and your machine. Plug the cable back into the switch PCB, making sure that the two pins of the header are oriented with pins 1 and 2 of the female header on the board. These will be the top two pins if the ‘INVENTABLES’ text on the board is upright. Place the metal button back in its cavity in the clamp, then line up the PCB with its mounting holes. Use the #00 screwdriver to replace the mounting screws. Take great care when replacing these screws as the mounting holes can become stripped if anything is forced. Once all four screws have been tightened, do another round of tightening to check that the board is seated properly. 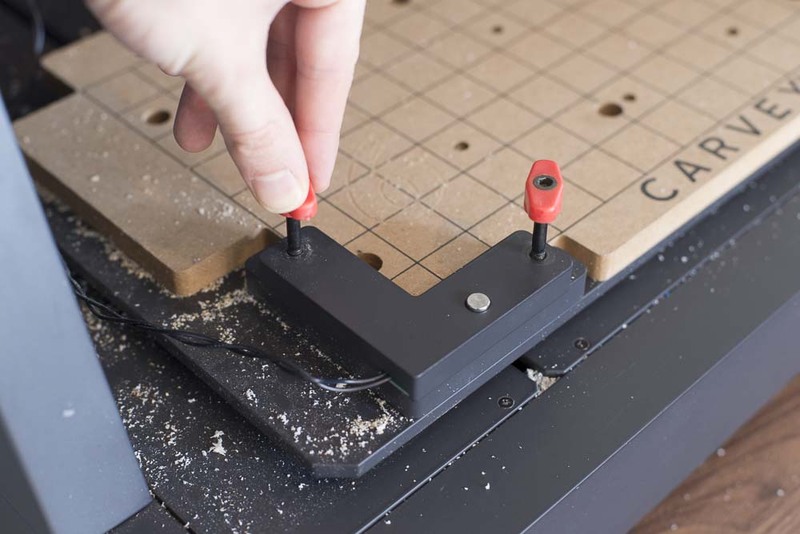 You can now replace the Smart Clamp in its usual spot on the board and get back to carving.